During the next few weeks leading up to the beginning of the cross-country season, MileSplit RI will highlight some of our top returning runners this fall. We graduated some outstanding harriers from last year, but we still have an impressive list of talent coming back this season with hopes of making their marks on the dirt trails. After a sophomore year in which he finished fifth overall at the State Meet, dos Reis had a difficult cross-country season in 2017, primarily due to contacting mononucleosis towards the last half of the fall campaign. But the Ram standout made up for it during successful indoor and outdoor track seasons. He won his first individual title at the indoor state meet, capturing the 1,500-meter run. Dos Reis took runner-up honors in his specialty at the outdoor states where he clocked his PB of 3:54.22. He also had a best of 8:46.12 for the 3K. A healthy dos Reis at the state meet in November could create havoc for his rivals. As a tenth-grader, he clocked a best of 16:11 on Ponaganset's 5K course, site of the states. 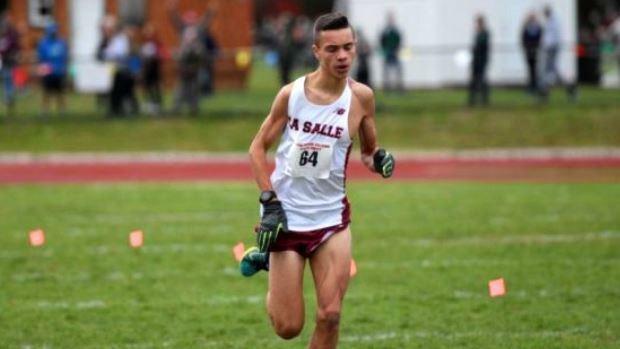 As we have stated and witnessed often, the La Salle runner has a devastating kick. This year's state meet appears to be wide open with a number of runners capable of breaking the tape at the end. If dos Reis is among those harriers still fighting for a top spot when they exit the woods for the final 600m on the Chieftains' covered-bridge trail, the chances are high he'll be the first across the line at the end.